Summertime, I keep it low on the make-up. On brutal days like today, it's just lip gloss. Anything more and you risk looking like an emotional clown. I actually have two lip glosses that I sort of rotate in regards to my daytime look and my nightime look. Illamasqua makes an amazing Sheer Lip Gloss that adds just a kick of color to your pout. It's my go-to gloss before cocktails. Provoke, which is a pearl like beige is my color of choice. It goes on smooth and on a sunny day it gives you just enough color to make you look done, but still stunning! 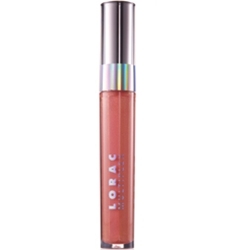 For night, I kick it up a notch with Lorac Multiplex 3D Lip Gloss. It gives my pucker that extra kick as if they are actually 3-D. Unlike most glosses, Lorac doesn't need constant reapplications nor is it tacky like you just had tons of greasy food. It's also free from dyes, fragrances and parabens. Your lips will scream for joy with any of these glosses. Whether you're going for 3D or bronze pucker, you have to check them out. For both Lorac and Illamasqua head over to your nearest Sephora to purchase.